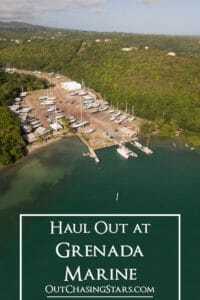 We enjoyed the facilities at Grenada Marine. We moored one night, then had the haul out for one night, then launched the next day and spent one more night on the mooring. 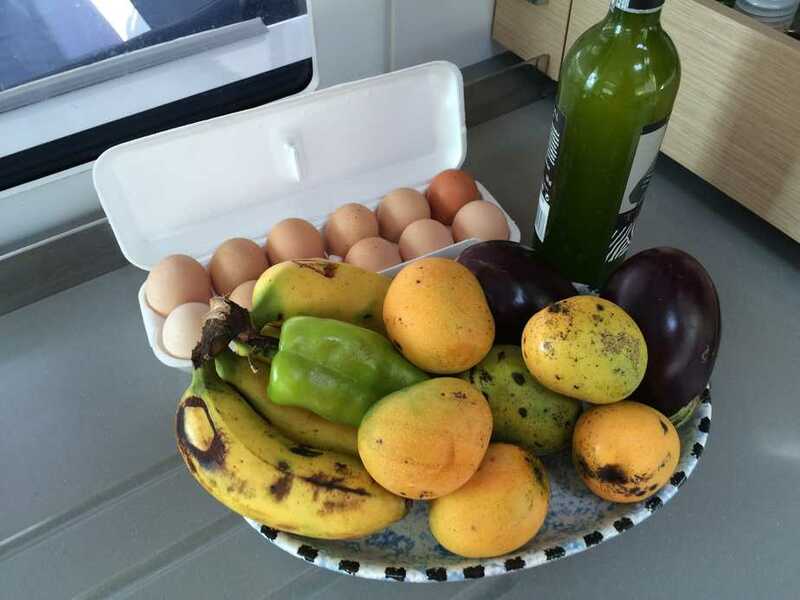 The moorings were cheap ($6USD) and the cost for the haul out was reasonable. There is a restaurant and Island Water World available, and the staff would help us get anything we needed the next day as long as it was on the island. 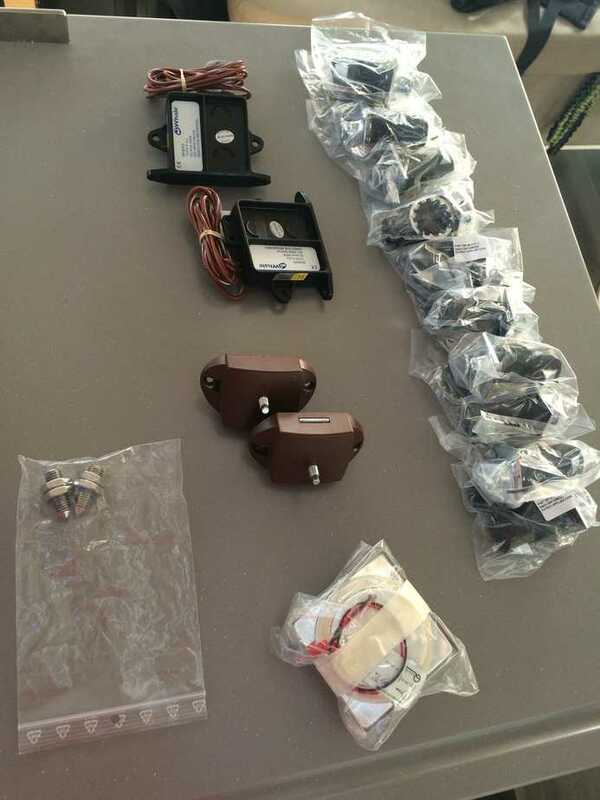 They received a package for us from Fountaine Pajot, almost like a care package of various hardware around the boat. 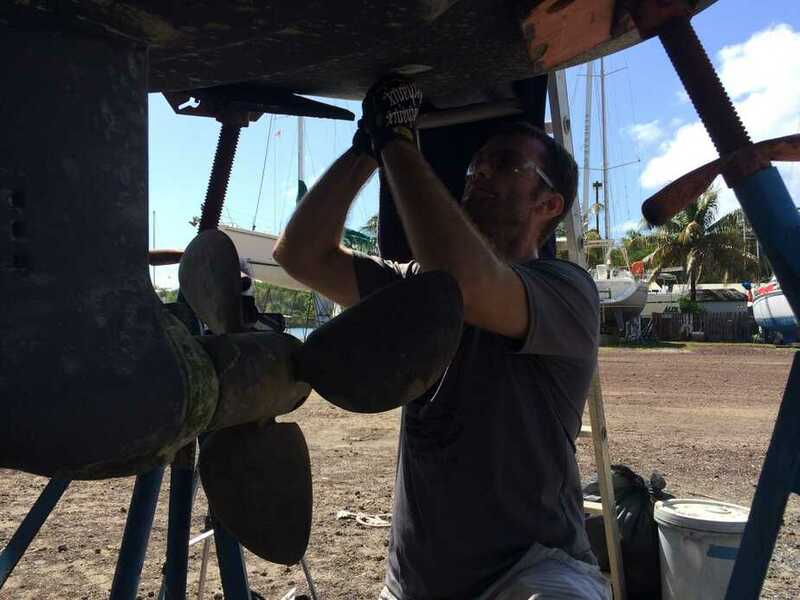 One of our biggest reasons for getting hauled out was to check the mini-keel damage we discovered while hauled out in Nanny Cay. 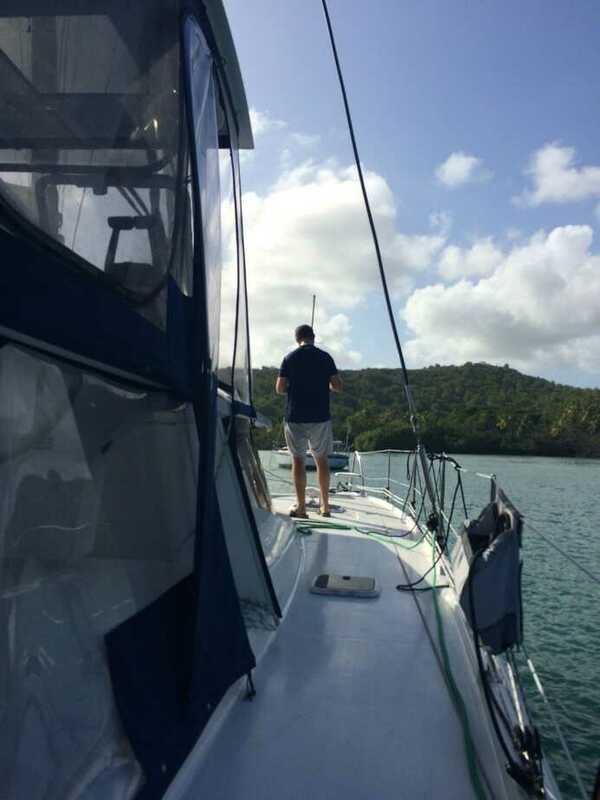 It was very easy to tell once we got hauled out at Grenada Marine that there was no water coming from the keel. Success! 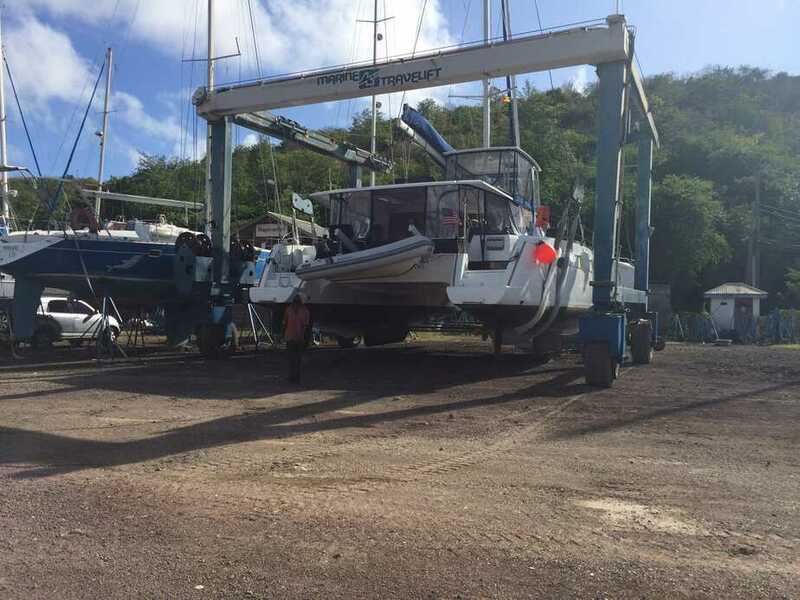 I asked around at Grenada Marine and was able to come up with a one-gallon can of Islander 44 bottom paint with about a half an inch of paint left (given to me for free!). 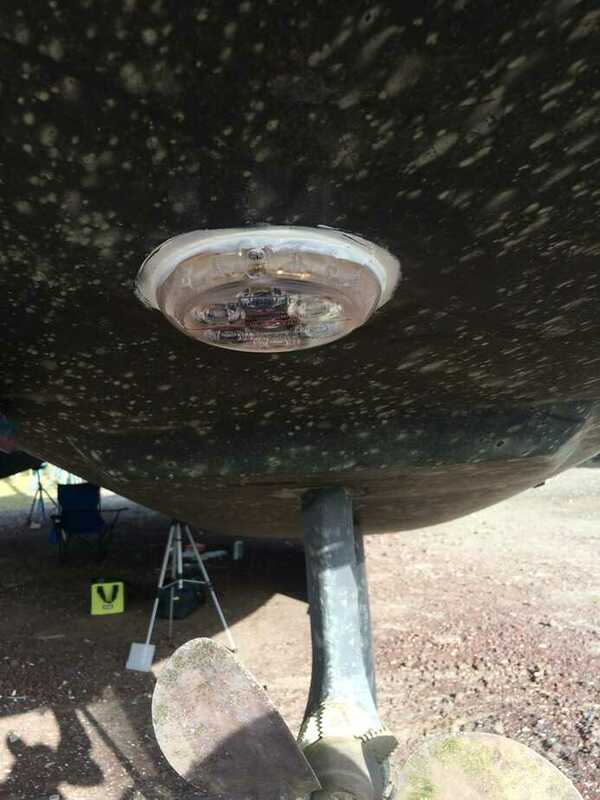 I took a brush and painted over any spots that looked bad – especially the port rudder where we had gotten a pot float stuck off of Deshaies. Hopefully, that will help our bottom paint last longer. My favorite project (and probably David’s least favorite) was our new underwater lights. This involved very careful measuring, cleaning the bottom paint off, drilling a half inch hole, applying sealant, and screwing the light in. David did a great job, we think. Only time will tell. We also had to re-bed our generator exhaust thru hole, which had been leaking. David took care of that. Our last personalized package delivery (aka Madeline) included snap and zipper lubricant. I took my time going around every single snap in our enclosure and lubricating it. I also lubricated the zippers and stitched up an area where our battens were popping out of the doors. Our radar reflector broke and fell off while on our way between Tyrell Bay and L’Esterre. We did a RROB (Radar Reflector Over Board) procedure and picked it up. David went up the mast while in St George’s to zip tie the reflector down to the stay. Despite David having re-bed the hatch in the forward guest head, it’s still been leaking. David attempted to pull the hatch off and re-bed it, but that sucker would NOT come off. There was lots of sweating and cursing involved. It was ugly. In the end, he applied sealant around the edges as a temporary fix to stop the leak. For a while now we will occasionally hear our fresh water pump run for 2 seconds. There is a leak somewhere in the system. David has spent a lot of time trying to track down where the leak is, but to no avail. This is really really stupid, but the sealant around the four windows on Starry Horizons freeboard leave black streaks running down the fiberglass. We have been cleaning it off with a soft sponge and dawn, but we got a product called Son of a Gun which will hopefully stop the streaks. One of our oil change pumps was leaking, so David fixed it! After the saltwater ingress from the generator exhaust thru hull, there was a ton of salt and grime in our starboard bilge, so I gave it a good cleaning. 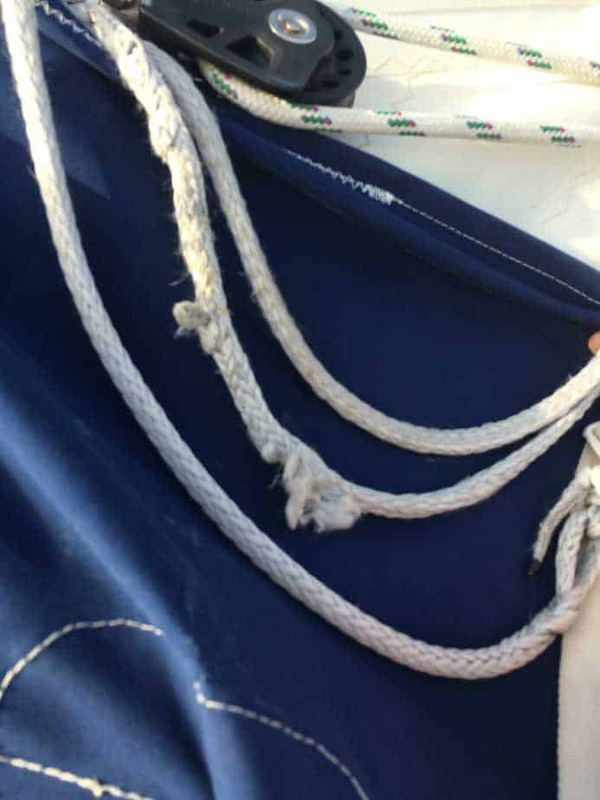 The line on our furler was coming a bit undone, so David re-whipped and re-stiched it back together. The Ocens software and optimizer we use to send and receive emails from our sat phone got changed, so David set up the new email address and tested the optimizer. We need to change our insurance to cover the new areas we are sailing to – instead of the Atlantic, we needed insurance to cover the Panama Canal and the Pacific. Unfortunately, our quote from Pantaneous was 3 times what we have paid the year before. 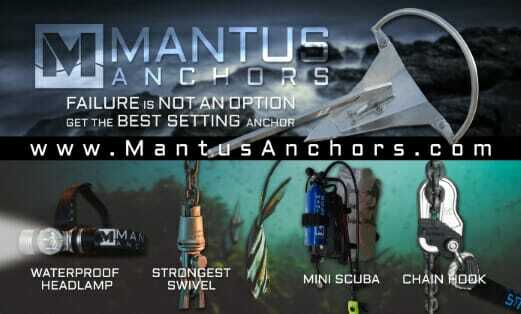 Jackline (IMIS) quoted us a much better number (still more expensive than the Atlantic though), so we made the switch. Incidences Sails in La Rochelle installed a rig that pulls the square-top of our main sail up to the mast. The line was really getting chafed, so I practiced my eye splice more and replaced the line. 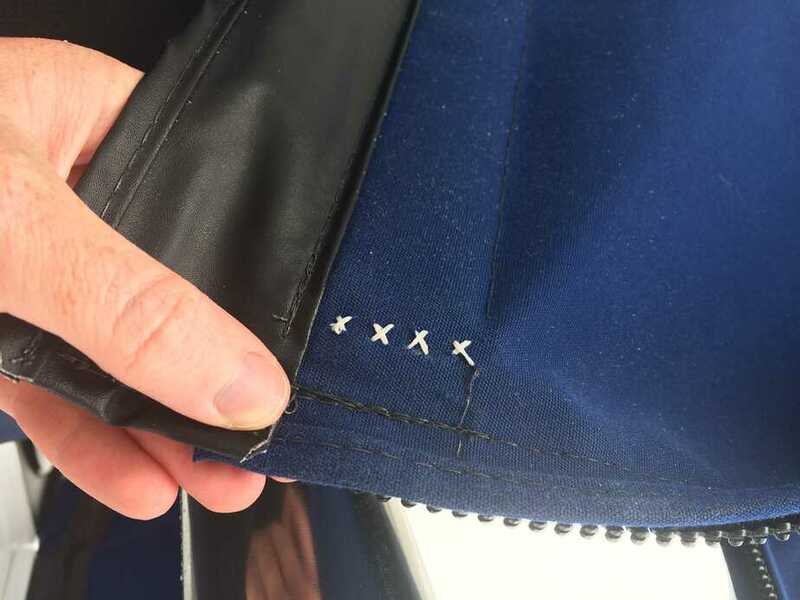 It was tricky…it’s never easy to get a line with two eye splices in it the right length. For both the Panama Canal and the Galapagos, you need to hire an agent to make your visit possible. We have picked agents for both places and have done a TON of research to determine what we need to do, who we have to see, and where we need to be. These are two intense areas in terms of regulations and costs. We use our propane tank for cooking in our stove and oven. There are many places around the world where it is difficult to get propane tanks refilled. Even in a place like New Zealand and the US, the tanks may not fit regulation requirements and places may not fill them. Our tanks are composite Viking/Ragasco tanks. There is a company called Lyte that manufactured composite tanks that underwent a recall. Since then, even though it was only one brand of composite tanks, some stations (like U-haul) will not refill ANY composite tank. With two 17 lb tanks, we should be able to go 10 months. That will allow us to use one up entirely, and then within the next 4-5 months get a refill when it is convenient. Meeting CJ, who dinghied out to us in the bay because he reads our blog! Saying hello to Zero to Cruising! Sitting on the back transom, listening to the swell on the beach and watching the fishies! And with that…we are off! We are departing for Panama, where we aim to transit the canal between March 7 – 11. From there, we will sail to the Galapagos (should arrive in late March/early April) to stay for about 2 weeks, and then on to our 3-week passage to French Polynesia. Hello. Nice blog. I enjoy reading your blogs. Keep posting. The pictures you have posted are awesome. It seems you have enjoyed a lot. 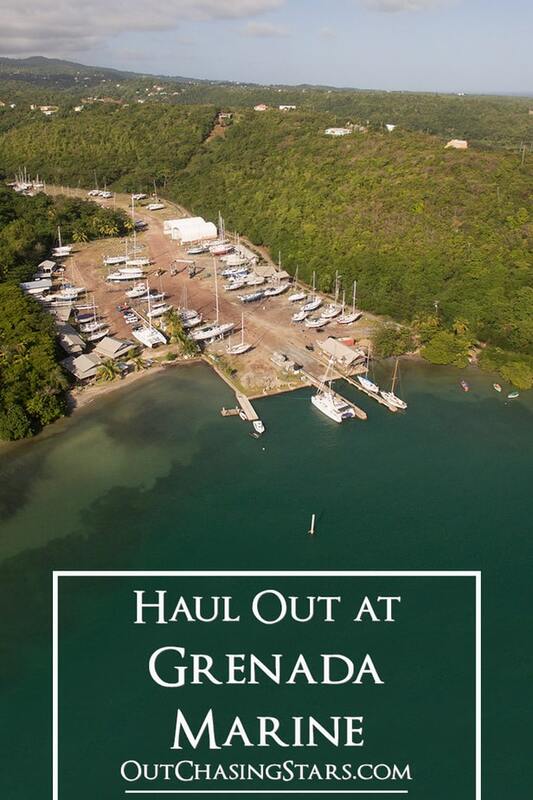 I am planning to have my coming holidays in Grenada with my friends and for this all arrangements are done by a local travel service provider sail-n-dive in Grenada. Hope we will enjoy to the fullest. Hi George! I am glad you have been enjoying the blog. Have a GREAT time in Grenada!! I really enjoy the maintenance posts too. I don’t have the sailing knowledge to fully comprehend your “en voyage” notes – but the maintenance part I get!!! It is especially awesome that readers are helping out with suggestions. Totally agree! Glad you are enjoying them! Great read, love the maintenance part the most. Would a gasket be an option for that stubborn hatch leak ? Pain to make but may do the trick . Saw the new helia evolution in miami last week it was very nice & thought of you guys . Have you had any problems with the pneumatic arms that hold the 2 forward deck compartment doors up ? And so far so good with the pneumatic arms. One has a piece that has started to rust a bit but is holding up okay so far. We have not had any problems with those lifts. One is a watertight locker and the other is not. The not waterproof one does have some rust, but no issues. Concerning your leakage in your fresh water system. If there is no leakage to find, it might be a defective or leaking check valve in the pressure pump! Maybe a cleaning will solve your problem. Thanks for the suggestion, but I think I finally found the problem! The pressure relief valve for our hot water heater apparently leaks only while the water heater is heating water, which is why it was so hard to find! A new pressure relief valve is on order so hopefully that fixes the problem! I actually lied! At the time I was drafting the post David hadn’t figured it out, but before we left he discovered it was the check valve on the water heater! Glad you are following us along!! We are working hard to keep her in good shape. Sounds like tons of fun. I love hearing about all the maintenance that goes into the boat. It is all just mentally preparing me for the work to come when we are able to purchase ours. 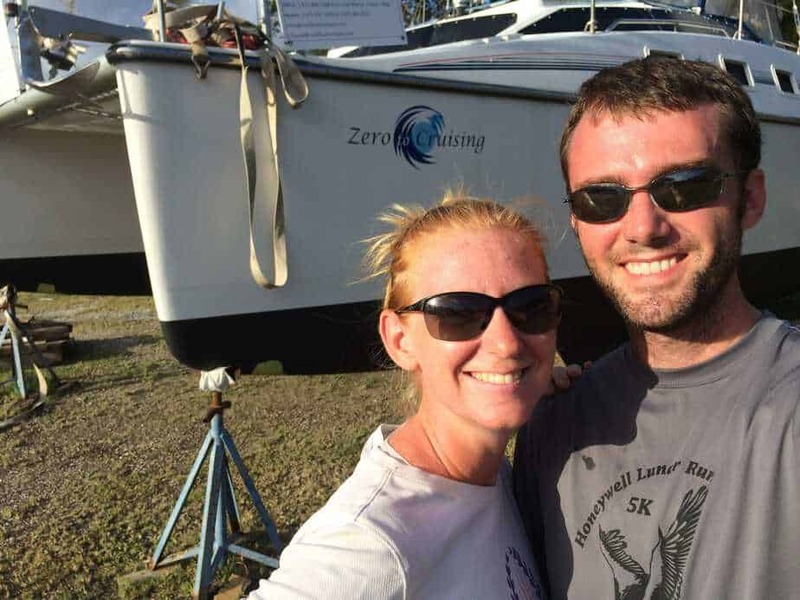 Great to see you both still energized and working to get into the Pacific. Have lot’s of fun. Hey guys! Great to hear from you. We are very excited for the Pacific!